In the Shift Schedules tab, you can create, update, and view schedules for your employees. You can also use this feature to easily email schedules to employees. Roles: Specify which roles you want to view. Time Format: View an employee's total hours in decimal numbers or hours and minutes. Date lets you select the week you wish to view. 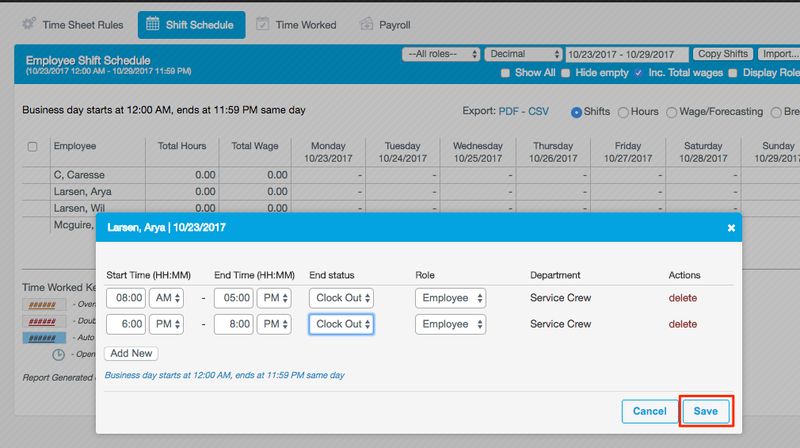 Copy Shifts lets you copy employee shifts from one week to another. Import allows you to import a schedule created on an Excel spreadsheet. Show All shows all employees and their schedules. Hide Empty hides employees with no shifts that week and overrides Show All. Include Total Wages shows or hides a column with employees’ total wages for the week. Display Roles shows a column with employees’ roles. Export exports the schedule as a PDF or Excel spreadsheet. Shifts shows employees’ schedules by shift time. Hours shows employees’ schedules by the number of hours scheduled. 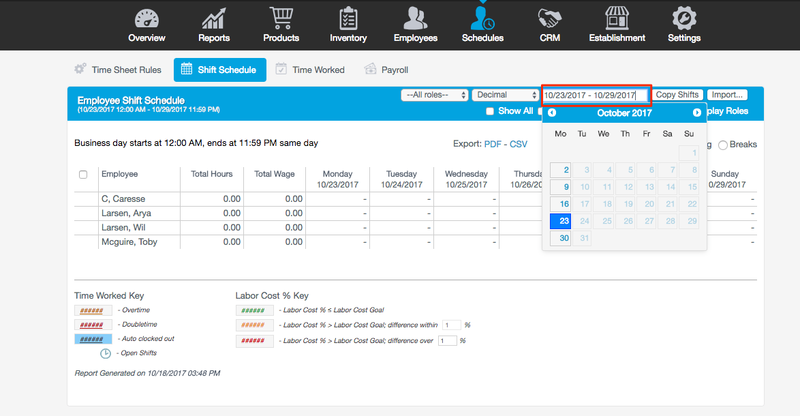 Wage/Forcasting lets you view projected payroll and sales by day. Breaks shows employee break times rather than their scheduled work hours. Creating shift schedules help you optimize and plan employee hours. In the Management Console, click on the Schedules tab. Next, use the calendar tool and select the dates for creating a schedule. Under the desired date, click the box to the right of the employee name. Select Add New, and fill in the scheduled hours of your employee. By clicking Add new, you can create another shift for the same day. Lastly, click Save. After your employee's schedule is created, check the box on the left side of an employee. Then, click Send Email in the bottom left corner. You can copy an entire schedule or a single employee’s schedule from one week to another. Please Note:Note that Aany shifts you copy will overwrite shifts that already exist in the target week. Check the box next to the employee’s name. You can change the schedule view depending on the settings you selected on the Employee Shift Schedule page. Wage Totals: The total wage earned by the employee for that week (based on set hourly wage and hours worked). Forecasted Sales: Here you can enter the employee's projected sales for the week. Mean Sales: This is the net average of the employee's last four weeks of sales. Forecasted Labor Cost %: The projected labor cost percentage.